A big car by anyone's standards, Audi's Q7 premium SUV is a little cleaner since its launch in 2006. Large SUVs haven't always been on the right side of public opinion but Audi has cleaned up the Q7's act, along with tweaking its appearance. The seven-seat SUV is not something for everyone. With the extra space comes a larger footprint. Audi's Q7 is hardly a small model, but that's the trade off for being a flexible and practical holdall. Only this holdall is more Gucci than high street. AS you'd expect, refinement is a big part of this big 4x4. With size comes responsibility - not something the super-large 4x4s have been known for in the past. Now, with talk centring on fuel economy and CO2 emissions, everybody has to be seen to do their bit. 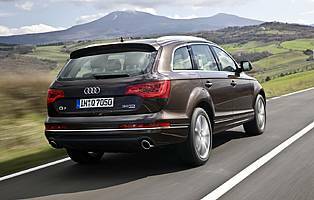 Audi's approach has been to make the Q7 more efficient, but without compromising its underlying abilities. With most European markets heavily focused on diesel for cars like the Q7, it's good to see more than just incremental improvements. Power and economy are up while emissions are down - there are similar improvements for the petrol units. 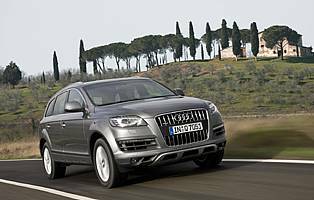 Through a programme of steady improvement and the application of energy recovery systems, the Q7's engines go a long way to silencing critics of the premium SUV sector. In an interesting technology-related twist, Audi has gone one better with its already popular 3.0-litre TDI unit. By offering a second engine badged 'Clean Diesel' this model boasts ultra-low harmful NOx particulate levels - the substance American law makers are clean on reducing. At launch, Audi's claims of the Q7 being the class leader in this area were more than mere hype. With Europe's concentration on CO2 levels it's debatable whether NOx reduction technology will take off, though. And the Clean Diesel model also commands a small price premium. The Clean Diesel variant is a smart move from Audi. Enhancing the Q7's green credentials should earn the car and its maker a little more respect. There's a chance the technology could gain traction outside North America, but don't hold your breath. In the meantime, the regular Q7s offer welcome reductions in all the keys areas without the extra price premium. And with the subtle visual tweaks they all look better, too.